Hi Heather! We love reading your blog! We have a design studio in Greenpoint and live here as well. Upon moving our business into a new space, on India St., in May we discovered the empty lot next door. We fell instantly in love with the space and couldn’t help but think of the possibilities. We got word that the landlord was going to concrete the lot in and turn it into a parking lot, so we jumped in and signed the lease. We have now developed a Kickstarter campaign to transform the space into inspiring experiential community garden focused on sustainability, urban living, and art. We are working to spread the word! Here is a link to more details about the project http://www.kickstarter.com/projects/1216881255/designplot?ref=live We love what you are doing and would love to find a way to work together on this! And one really big, totally amazing secret third act! Yummy local foods brought to you by Brooklyn’s Skytown and drinks provided by Brooklyn Brewery. $15 suggested donation for the event. We would love it if you could come! Feel free to tell all your friends! 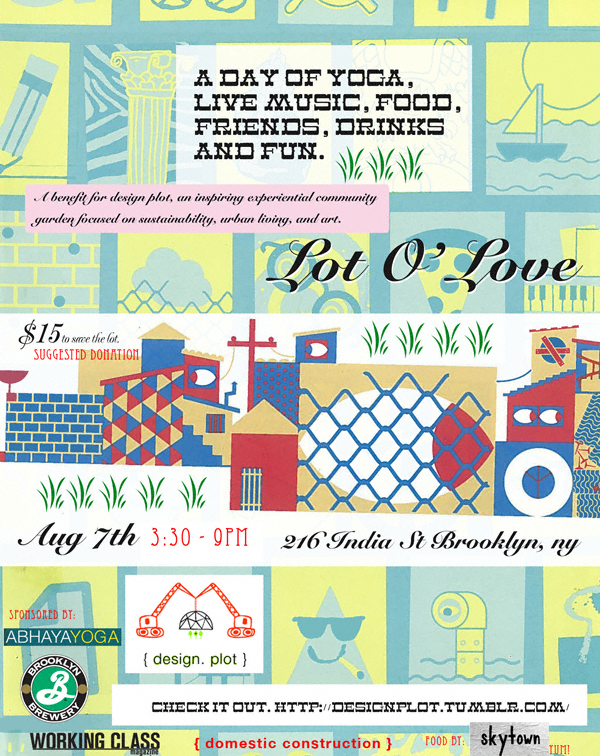 We are so excited to make this happen for Greenpoint! It has long been a wish of mine that a community garden happen in the Garden Spot. Therefore I suppose it goes without saying that I am very excited about what Trish and Maureen are cooking up. Although I plan to meet with them in person and discuss how I can help them with this endeavor, in the meantime methinks I will make a donation to their Kickstarter page— and swing by this event. Those of you who share my enthusiasm should do so as well! August 7, 2011 starting at 3:30 p.m.